Since their move away from Highbury to Emirates Arsenal has been competitive at the top level without spending crazy money like other title contenders. But over the last 2-3 years Arsenal are starting to splash the cash but still no way near what City, United or Chelsea are spending. Going into the 2017-18 season Arsenal’s Wage bill is pretty healthy at £195 million fifth highest in the league. Arsenal only signed one high profile player in 2017 transfer window and that is Alexandre Lacazette for £46 million. We breakdown the entire Arsenal squad, contracts and player salaries for upcoming 2017-18 season. Arsenal’s wage bill has been steadily increasing over the last three season. Back in 2014 wage bill was around £166 million which was dramatically increased to £180 million in 2015 followed by £195 million 2016. Arsenal did not spent over the top in the summer of 2017 and both Ozil and Sanchez are yet to sign new deals. If things go as planned we can expect Arsenal’s wage bill to touch £200 million if Ozil, Sanches and couple of other important players sign new deals. Arsenal wage structure has been pretty good since they moved to Emirates and the model has kept them competitive without over spending in the inflated market in recent years but with Premier League TV money allowing english clubs to spend big Arsenal are forced to hand out massive contracts to big names in the squad or risk losing them. However unlike last year, they only signed 1 high profile player in Alexandre Lacazette and rest of the squad remain pretty much unchanged. Currently their highest paid player in the squad are Mesut Ozil who is earning £140,000 a week in salary and Arsenal has already offered him improved contract of around £180,000 a week to fend off any interest from other top clubs. 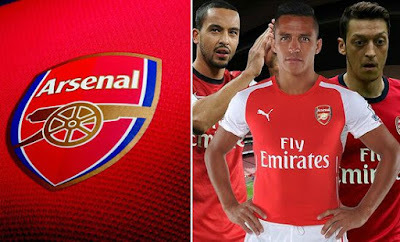 Alexies Sanchez is currently on £140,000-a-week but just like Ozil has been offered improved contract with £180,000 a week. Arsene Wenger himself pockets as much as £8 million a year after signing 2 year deal to remain at the club. 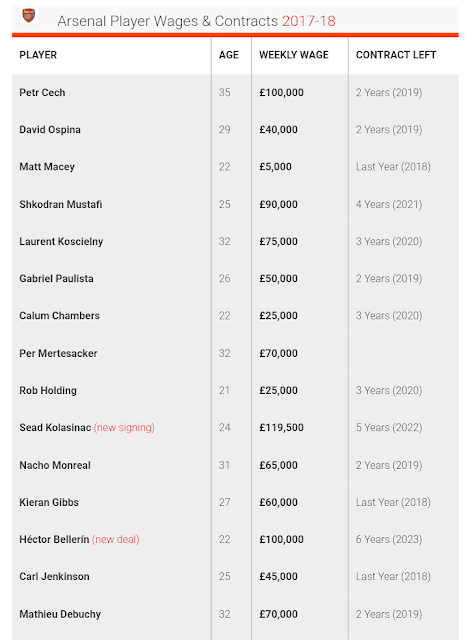 Below is the list of entire Arsenal squad contracts and weekly salaries.